Knowledge is power and one of the best ways you can prepare yourself for this new role is to educate yourself about the type of stroke that your parent has suffered from. Indeed, one of the biggest problems that many caregivers encounter when caring for their parent is a lack of information. Be sure to make contact with your parent’s health care team about the topic of stroke recovery—do not be afraid to ask questions. You could even consider partaking in a support group in the hospital. This knowledge will allow you to take the best possible care of your parent. It is imperative that you get involved as much as possible in the rehabilitation process. This can help people feel supported and give them motivation to continue in their recovery, and to hopefully be independent once again. Encouraging even small improvements can be helpful, but be careful not to be pressuring. Although your parent’s medical professionals will likely inform you if home modifications will be necessary, it is helpful to keep this in mind. Home modifications may be as simple as rearranging furniture, but it may also involve widening doorways or even remodeling the bathroom. 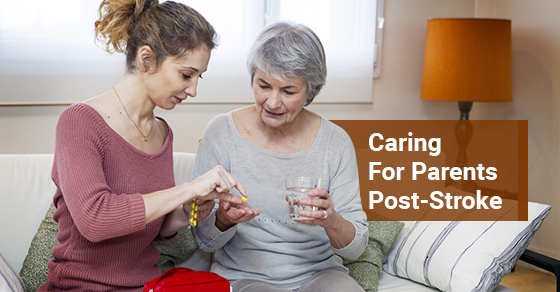 The reality of your new caregiving role is that you may not be able to care for your elderly parent or devote as much time as you would like due to other demands in your life. Home care health services offer a variety of services that can be customized to exactly to the kind of help you are seeking. Allowing the burden to be taken off of you can be very important in preventing caregiver burnout during this stressful time. Studies show that stroke sufferers with larger support systems to facilitate their recovery do better after a stroke than those without. Accept as much help as possible during this time. In order to prevent future strokes and their devastating consequences, you should prioritize your parent’s health. This is especially true given that those who have suffered from a stroke in the past are more likely to suffer from one again. This means getting your parent’s blood pressure in check, managing their weight, blood sugar and cholesterol. Ensure that they get daily exercise, eat a healthy diet and do not smoke. C-Care Health Services offers a variety of affordable, personalized and high quality services. Contact us today for more.